If you wish to visit the Sanctuary and see the facilities we would be delighted to give you a tour. Please make an appointment by calling 845.658.3439. This is necessary to ensure the privacy and quiet of our guests. *note to driver: these directions are exact. Click on the map for a larger, printable image. Take exit 19 from I-87 to 209 South. 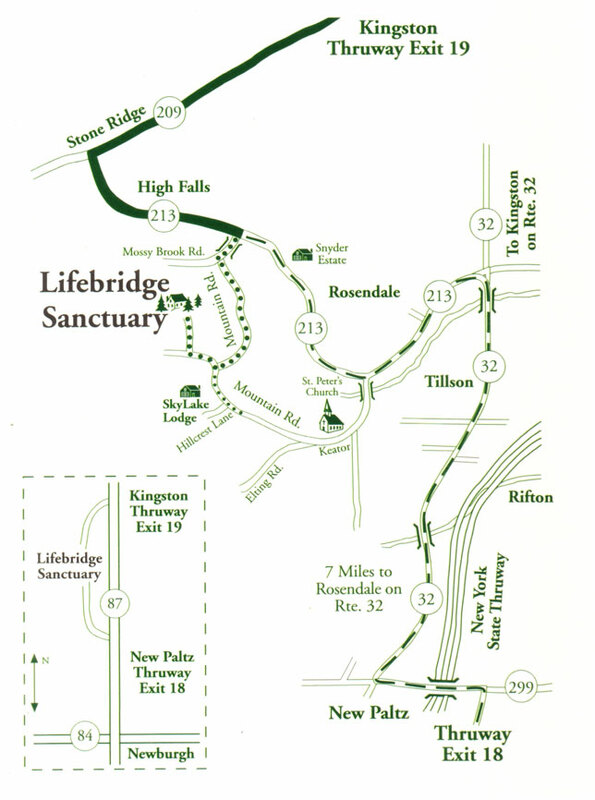 Proceed 10.5 miles through Stone Ridge, then turn left at the 3rd light onto 213 East toward Rosendale. 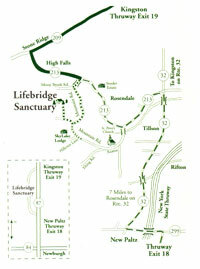 Go 2.5 miles through High Falls and at the bottom of the hill, turn right onto Mossy Brook Road. Take the first immediate left onto Mountain Road and up .8 of a mile. Make a hard right into the driveway. Take the right fork in the driveway. LOCAL TAXI SERVICE: There are two taxi services available at Rosendale: Chase Transportation, 845-389-0835 and High Falls Taxi, 845-626-9620. It is necessary that the passenger call at least 24 hours ahead to reserve the taxi in order to ensure timely pick up at the bus stop in Rosendale! NOTE: Taxis to Rosendale are available at the Poughkeepsie station. Call Delroy Taxi: 845.452.1222. Cabs meet most trains. Some taxis will pick you up in Rosendale for your return trip - though they may require you to prepay for your return service. Call in advance for detailed information. There is a $2.00 shuttle bus with a limited schedule between Poughkeepsie train station and Rosendale Park and Ride - it takes about 45 minutes. You will need to coordinate your arrival with your group leader, the Park and Ride is 5 minutes from Lifebridge. Call in advance 888.827.8228 for shuttle schedule and fees. Ask for dispatch. ALBANY INTERNATIONAL AIRPORT is approximately 1 hour 15 minutes North of the Sanctuary: Click on the airport link for ground transportation information to the Sanctuary. We recommend a car rental although car service is available from the airport. All NY Metropolitan area Airports connect to Port Authority Terminal via the NYC Airporter Busses. Go to the South Terminal, 8th Ave. bet 40 & 41st Streets, for Trailways Bus service to Rosendale. 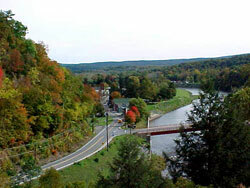 The Town of Rosendale was founded in 1844. Rosendale was once famous for the cement it produced. Once known for the best quality cement available anywhere in the world, cement from Rosendale was used in the construction of many National landmarks, including: the U.S. Capitol, the Washington Monument, the bases of the Statue of Liberty and Brooklyn Bridge, the Hoover Dam, and many others, including New York City's Grand Central Terminal. One of the most interesting sites to visit in Rosendale is the Century House Historical Society www.centuryhouse.org: the A.J. Snyder Estate, featuring the Widow Jane Mine an old cement mine, now a museum. These folks preserve Rosendale's history. The area is rich in limestone deposits and rosy quartz conglomerate. 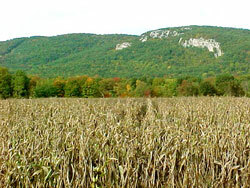 Rosendale is located at the northern terminus of the famous Shawangunk Ridge widely known for its impressive biological diversity and unique geology. There are numerous notable features including: dramatic cliffs and outcroppings; ice caves; and talus fields. The Shawangunk Ridge is an important resource for all the surrounding towns that border the ridge as it contains the headwaters of numerous mountain streams and provides a pristine watershed for aquifer recharge and public drinking water supplies. The ridge is also a very significant ecological habitat containing: globally significant dwarf pine forests, rare pitch pine forests, numerous rare plant and animal species, and large segments of unbroken forest communities.